I have always had an affinity for the natural world and especially the ocean. Growing up in a military family and having opportunities to travel to numerous countries throughout my young life I've been exposed to a diversity of locals and environments that has instilled in me an appreciation of the natural world. The ocean has always been an important part of my life and pursuing studies in marine conservation science was a way for me to align my life with the ocean. I received my B.S. in Biology from Point Loma Nazarene University in 2007. During my time as an undergraduate I lived in Costa Rica where my first exposure to marine ecology was working with coral reefs and nesting leatherback sea turtles. Upon returning, I wanted to continue studying sea turtle ecology and worked as an intern at the National Marine Fisheries Service's Southwest Fisheries Science Center in the marine turtle ecology group. 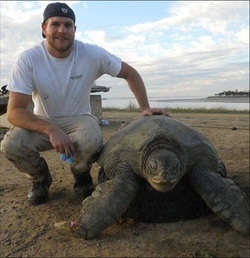 After graduating, I worked full time for the marine turtle ecology group for two years. While at this position I not only developed my field, analytical and laboratory skills but also had opportunities to gain experience in other marine research including traveling to Antarctica as a member of the 2010 Antarctic Marine Living Resources survey team. My interests in trophic ecology and desire to work in conservation ecology grew during my time at the fisheries and I decided to further my education at SDSU in order to develop more skills and become a better scientist. I am a second year Master's in the ecology program at SDSU. My research focuses on developing and applying new analytical tools to study green turtle ecology and life history in the context of conservation. I enjoy the outdoors, swimming, surfing and running. I am a fan of live music especially reggae and bluegrass. The East Pacific green turtle (Chelonia mydas) is threatened under the U.S. Endangered Species act and listed as endangered on the IUCN red list. The post-hatching oceanic stage of the the green turtle remains largely mysterious and represents a time when these turtles are susceptible to threats such as fishery interactions. Stable isotope analysis has been applied to investigate the ecology of many marine organisms and my research aims to use a novel isotope methodology to investigate the ecology of the oceanic stage of East Pacific green turtles. In general, my research interests include investigating the trophic ecology of marine organisms and understanding nutrient flow and composition of marine systems in the context of conservation science. I use stable isotope analysis as a tool to answer many of my research questions. For my thesis research I am developing compound specific isotope analysis for green turtles and applying this technique to look at the trophic ecology and life history of these animals during their mysterious oceanic years. Allen CD, Lemons GE, Eguchi T, LeRoux R, . Fahy CC, Dutton PH, Balazs GH, Parker DM, Peckham SH, Seminoff, JA (2013) Stable isotope analysis reveals migratory origin of loggerhead turtles in the Southern California Bight: implications for fisheries management. Marine Ecology Progress Series. 472: 275- 285.